Handwriting expert and occupational therapists works closely with candidates to improve the handwriting skills. 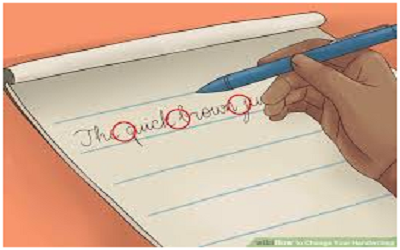 Teachers apply scientific technique which guarantee’s handwriting improvement of the candidate enrolled. Multisensory Technique: Teachers use multisensory techniques using touch, feel, music, visualization and air writing to develop the hand writing skills of students. Candidates work on handwriting attributes like shapes, sizes, slants, spacing, line alignment and legibility. 1) Books for the Class Room. 2) Books for the Home Work Assignments. Students shall bring Pencil, Eraser and Sharpener. Adults shall bring to bring their own Pen. The Pen will be suggested by us. Handwriting and Speed Writing Improvement for Kids or Adults. 1. Techniques of improving English Handwriting. 2. Techniques of Speed Writing. 3. Techniques on using slants, shapes, sizes and spacing while writing. 5. Body postures while writing. 6. Techniques to keep the Books or note pads while writing. 7. Techniques to correct shoulder positions while writing. 8. Techniques of using scientific pens and pencils. 10. Techniques to write faster and neat in Tests and Exams. 2) Improvement in Speed of Writing. 4) Avoid embarrassment of bad and untidy handwriting. 5) Good handwriting gives confidence. 6) Make an impression with beautiful handwriting. 7) Write with confidence in books, journals, cheques , application forms. 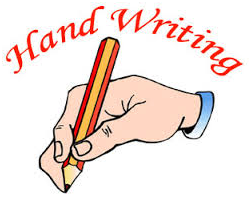 8) Good handwriting helps in developing personality. 9) Score good marks in examinations. 10) Good handwriting helps creates good career opportunities. 1)Try using a fountain pen, or ballpoint pen with good ink-flow. This will produce standardized width letters with minimal drag between letters. 2)Relax your hands. Apply a firm amount of pressure around the pen, but remember that you need to be relaxed and calm when you write. It's imperative to the improvement of your writing that you aren't cramping your hands. Your writing will only get worse if your hands are tensed. 3)Do not give more than enough pressure on the paper. 4)Try to make your handwriting easy on the eyes, non-cursive type. Lots of people may not know cursive. 5)Practice writing whenever you can. 6)Practice writing in a journal or diary to improve penmanship. 7)Try writing on a white board. As face reflects mind set so does hand writing on Personality. Person’s handwriting reveals character, intelligence, honesty, communication, presentation, behavior, goal orientation, negativity, physical energy, anxieties and hidden talents. Bad Handwriting can be perceived as : Careless, Lazy, Untidy, Dumb.